You’ve surely come across the term value betting at some point. But what does it really mean? How can you make sure that you get the best value bets? In fact, what are value bets, anyway? The first point to consider is that value means getting more for your money. A shop that offers value will sell quality products at a good price. A restaurant will be good value if their food is better than the price suggests. Well, it is very similar when it comes to betting. Quite simply, a value bet offers great odds. The bookie’s odds are likely to appear generous when you analyse them closely. A value bet is a selection with higher odds compared to the selection’s chances of happening. Example: you have placed a bet on a football team to win at odds 2.5. You calculated there is a 50% chance of the team winning. Converting the 50% chance of a team winning in to betting odds gives you odds 2.0. Since you have secured higher odds of 2.5, you have placed a value bet. This kind of bet gives you more for your money. It doesn’t guarantee you will win or take out all of the risk. Yet, it does mean that you can bet with confidence. Let’s take a look at the 3 main ways of finding value bets. There is more than one strategy of finding value bets. Understanding these methods and choosing the right one is vital. It certainly isn’t a case of just deciding to use value bets. You also need to understand the different approaches. Each way of finding value bets has pros and cons for you to consider. By doing this, you can work out which method is right for you. You might even decide to try a couple of them. However, the most important point is to avoid the types of value betting that don’t suit your personality. I’d recommend most people stick with line grinding which I’ve written about below. It’s the easiest out of the 3 main types of value betting. Quantitative analysis are also known as quants. This approach uses mathematical principles of specialised database analysis. Yes, it sounds kind of complicated and to be honest it is. People who work on identifying this kind of bet will usually have a deep knowledge of maths. It isn’t the sort of thing that anyone can just dive in and get started on. You can’t expect to just start doing this well from the start. Rather, it is more likely that you rely upon an expert to do this for you. Value betting services will identify the bets that they think you should make. Some will use this approach to do so. Of course, if you are a number cruncher extraordinaire you might use this way of identifying value bets. It is an incredibly satisfying way of identifying bets if you have the skills needed to do it. 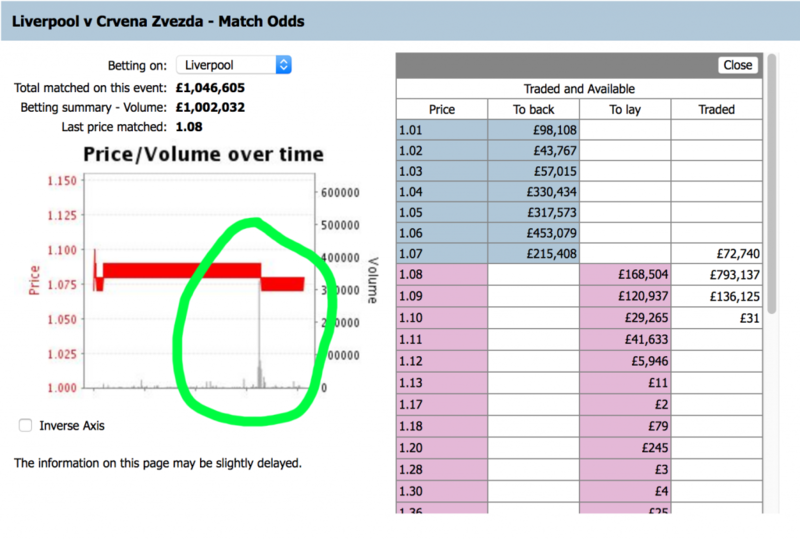 If you look at the green circle above, that is a Quant correcting the odds by 1 tick with a £150,000 bet! Their model has spotted a small amount of value and they’ve mopped it all up! Handicapping is another way of identifying worthwhile value bets. Again, this probably isn’t something that you will do alone. It can only be done effectively by people who have a deep knowledge of a particular sport. They can then use this knowledge to good effect. They put a numerical rating down for each team. This is then compared to the odds on offer. If the odds are higher than the numerical rating they will bet. As mentioned, you need a specialised knowledge. For instance, you won’t be able to focus on every single horse race. This means that you more likely to look at something specific. A good example comes with 3 year old handicapped horses. Can you find some that are underrated by the British Horse Racing authority? Handicap races enable horses of varied ability to race competitively against each other. This is done by the allocation of weight. The higher their handicap rating, the more weight a horse is required to carry. 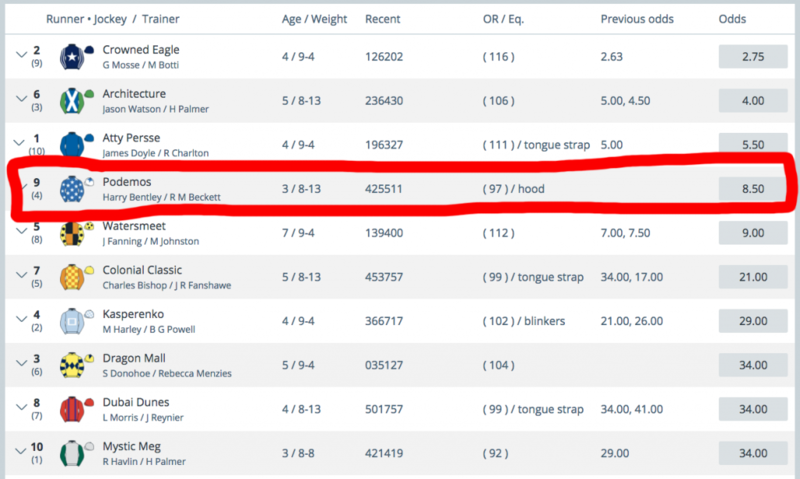 These ratings are set by the BHA. What if you can spot horses that are underrated by the BHA? Then you have value betting possibilities. Since they are carrying less weight than they should be, they are able to run faster. This means they have more chance of winning than their odds show. To make it work you need to narrow down your niche. No one can expect to know enough about an entire sport to do this well enough. Money can only be made if you focus on a specific area. Do you have very specialised knowledge of one area of a sport? If so, you will likely be able to find value that the rest of the market can’t see. If not, you might choose to pay for a service that find value bets in this way. This method uses sharp bookmaker’s odds to your advantage. This allows you to estimate the percentage chance of any given outcome happening. You then place the bets with a bookmaker who has the highest odds. This needs to be a bookies offering off–market odds. This is where you gain genuine value. If a bookie is out of step with the rest then there is an opportunity. It sounds simple but how do you get started? First of all, who are these sharp bookmakers? They are basically bookies who operate with tight margins. They also don’t ban winning players. This type of bookmaker includes the likes of Betfair & Pinnacle Sports. Any value is quickly mopped up astute users. If their odds were often incorrect, they would end up going bankrupt. How could this system work in real life? A great example is when an unexpected change is announced just before a football match. Imagine Manchester United announcing a key player is missing in the build-up to a game against Juventus. Punters are going to think that the chances of Juventus winning have just increased. The bookies will think this too. Suddenly, the existing odds on offer are no longer completely accurate. In this situation, the odds on Juventus winning are going to be cut. The sharp bookies are going to alter their odds automatically and swiftly. However, some of the others have a manual process for changing their odds. This means that it can take them longer to react. Juventus could stay at longer odds for a while. This needs to be just long enough for you to take advantage. With these bookmakers, you can take advantage with value betting if they are slow in reacting. When this happens, their odds are higher than everyone else’s for a short period. You can jump in and take odds that are higher than the true percentage change of them winning. That is how you profit from value betting! I’ve included examples of how to find the bets later on. You need to know where to look for these opportunities. Who exactly are the bookmakers with the sharpest odds? The following are some of the main names to look out for. When there is a sudden shift due of new information, the bookies above will have the correct odds. They move quickly to react to changes in the market. What if you see other bookies with odds that stand out as being different? These are probably the one that are ideal for value betting purposes. From here on, we will focus on line grinding. This is because it is the easiest way to make money from value betting. How to Find Value Bets? What is the simplest form of value bet that you can find? It can be where a bookmaker is offering higher odds than those available on Betfair. Since this exchange is a 100% sharp book, you know you are getting odds higher than the true percentage chance of the outcome happening. This can be done in a couple of different ways, really. For instance, you could use a simple piece of arbitrage software. Alternatively, you could manually compare the odds. A quick check of the Arbitrage software throws up this horse racing bet – Podemis to win the 18:00 Kempton. Betfair lay odds are 7.8. Head over to Sporting Bet to check the odds are correct. Then you simply place a back bet on the horse to win the race with Sporting Bet. Betfair is a 100% book with no margin. We know that the odds of 7.8 are accurate compared to the selections chance of winning. You placed the bet at odds 8.5 which are higher. It works out as a rating of 108.9 (back odds divided by the lay odds). Anything above 100 is classed as a value bet. Another example of how this can be done is with a dutching strategy. In this case, you need to find dutch bets between sharp bookmakers and soft bookmakers. You then place your bets on the selection that has higher odds than the sharp bookmaker. This is because the sharp bookmakers’ lines are correct. Checking the Dutching software I have found this 3-way bet on Dunfermline v Morton. There is a big difference in both Dunfermline & Mortons odds. Since Pinnacle is the sharp book, we know their odds are going to be similar compared to the selection’s chances of winning . You would back Dumfermlin with Betfair Sportsbook at odds 2.2 since they are higher than Pinnacles odds (1.694). It’s a little more complicated to work out the value. Pinnacle have a margin built in too their odds. That’s how they make a profit. To work out the value, open the Dutching calculator. As you need to beat the Pinnacle margin, the return needs to be a positive figure for it to be a value bet. This example, a return of 5.24% is an excellent bet! Place enough of those and over the long term you will make a healthy profit. 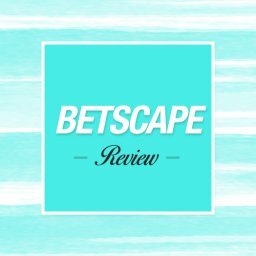 The best place to look for these bets is either buy a piece of software to find them for you or use the odds comparison websites like Oddschecker, Odds Portal, BM Bets & Bet Brain. If you use the comparison websites, it takes a lot more time trawling through the events. So, let’s take a look at a few more value betting strategies you might be interested in. How can you best make money in this way? The best value system is the Each Way Sniper Advantage Play system. It’s basically Each Way Arbing. There is no need to place a lay bet when you choose this strategy. The value is in the bookie’s odds. My long term results show a 20% profit on back stakes placed. Each Way Sniper Advantage Play works by exploiting a pricing loophole within bookmakers Each Way bets. The bookies pay more for the place than the win-odds imply they should. Here’s a bet that was flagged up today by Each Way Sniper. That’s some difference in odds. If you pay close attention to the difference in the place odds, you can see the loophole in action. The edge using this strategy is massive! You won’t find anything like this as it’s based on a mathematical pricing loophole. The rating is 155.43! Compare that to the Sporting Bet example above (108.9) and you can see just how much value there is on offer! With the value strategy, you simply place a straight back bet on any horse with a rating above 100. Horse racing arbitrage is another way of finding value in your bets. Again, there is no need for a lay bet to be placed. The value comes from the bookmaker’s odds in this example. This involves finding a horse that has higher odds than the Betfair lay odds. Long term, you can win approximately 10% of your back stake in profit. My results show a 10% profit on back stakes. I’ve tested using higher odds than 10.0 however it wasn’t as reliable. It also increased the losing runs which I don’t like! With this value strategy, you simply place a straight back bet on any horse that meets the criteria above. What about the idea of value bets on Betfair? I’ve written before about how efficient Betfair is. It’s not easy to make money on their. When football prices move on Pinnacle sharply then you should back the team on Betfair. Betfair can take a few minutes to catch up. The most important point is the odds should be falling on both Pinnacle & Betfair. Unless you’re a pro, never go against a sharp book trend. You need to make sure you back before any major moves. Also, you should never chase it. Given that the odds on Betfair are very efficient this isn’t a huge money spinner. Yet, it still works well and can bring in consistent profits over time. Should you pay for a value betting system to help you out? If so, which one should you choose to go with? There are a few different options that you might like to look at. One value betting system worth investigating is called Trademate Sports. It is a slick and professional service that has value betting software. They identify good value odds. However, it is recommended that you don’t bet on every opportunity they identify. They are open about the fact that your bookie accounts can get suspended with this strategy. The bets tend to be on football & tennis. What about the potential profits? Is it worth it? Are you going to win a decent amount of cash? Their Trademate bot states that there has been a 163.4% fund growth using this system. My tests show a 3 – 5% profit on your back stakes which is lower than the systems I’ve already mentioned. So, their track record is pretty impressive. However, it should be pointed out that it is a fairly expensive system to subscribe to. You will also need a pretty big starting bank. These two points mean that Trademate Sports isn’t right for everyone. If you want a safer approach with less risk then there are other systems you might prefer. This one is more suitable for someone who is happy to invest a good deal of money. Having said that, there is a 7 day free trial if you want to test it out. Who Does Value Betting Suit? This isn’t a risk-free approach to betting. This means that it won’t suit someone who likes matched betting’s safe and steady approach. If you want a second income you can hang your hat on then this isn’t right for you. If you are already Matched Betting I’d stick with that. Once you have bonus banned accounts, then you can start looking at value betting. You will make a lot more money hammering the bonuses than you will from value bets. Also, if you choose to work out the odds on your own then it is a fairly long and complicated process. So, it could suit someone who loves crunching numbers. As we saw earlier, you can also use in-depth knowledge of a certain part of a sport. If you are an expert in a certain field then this is way of using it to your advantage. You will need a fair amount of time to do this well using either of those last two approaches. What about paying for a value betting system? This is clearly a method that takes up less of your time. It could work for you if you are short of time or just want an easier approach. As mentioned earlier, value betting isn’t risk-free. However, if you use the line grinding approach and place a large enough sample of bets, you are likely to come out with a healthy profit. You will want to be confident of managing your bank roll wisely. All of this means that there are types of value bet strategy for most people. Is it right for you? Hopefully, understanding the different options helps you to make a good decision. There is no doubt that value bets offer you a way of placing smart bets. This can prove to be a very profitable approach. Plenty of people love to make money with this kind of betting. Value betting isn’t right for everyone, though. To work out whether to try it you should consider your goals. Do you want a way of beating the bookies that can work wonders? Do you not mind the risk of losing sometimes? When used well, value betting is a great way of making money. You might even decide to use it as an addition to other types of betting, for greater variety. 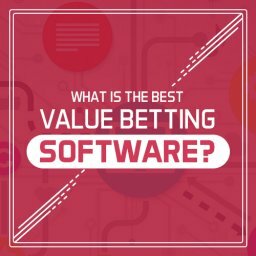 What Is the Best Value Betting Software? If you are fed up losing money to the bookies it is time for a change. Could using the right type of software bring your betting up to the next level? Specifically, can it make your value betting approach more profitable? This is a very tempting idea. With one simple tool you will be advised which bets are likely to be money-spinners. Value betting software could be exactly what you need. Doesn’t that sound like the sort of easy life that we all crave? Click here to read the full guide. What about if a strong favourite goes behind in the first half. Then there should be value in backing the draw? Hi Andrew, This is all done pre-match. It is nothing to do with trading or guessing what’s going to happen next. There is unlikely to be advantage backing the draw after a strong favourite goes ahead. It’s all priced in to the odds. I think there could be an overreaction though if a strong favourite goes behind unexpectedly. It’s the same system! If you look at the E/W Sniper website menu, it’s the value system. The horse racing value bets you describe here with rating over 100% and odds below 10 is this just a single back bet or an E/W back (no lay) and do you have a reliable minimum odds? The E/W value system states minimum odds of 7.0. Is there enough to be had between 7 & 10? You can use any odds with the horse racing value system. Yes, it’s just a single back bet. The E/W system is different. The reason you don’t back odds under 7.0 is the place odds (that’s were the value is) are too low. The risk v reward isn’t worth it in my opinion. Do not confuse the 2 systems. They are both different and have their own rules. £200 is more than enough to get started with the EWS value system. It’s better to start off with smaller bets and compound your winnings. Just make sure you follow the bankroll advice. What most people do is use the software for 30 minutes – 1 hour per day when the racing is on and place as many bets as possible. You don’t need to be sat there all day. You can with horse racing bets & E/W arbs as the odds are the same as those online. The football odds are different, it won’t work with them. Basically, which Software do I need to be able to check the Pinnacle / Betfair markets, is the Matched betting Software. Yes, use the Matched Betting Software for finding the value bets. The Insiders Club System is not available to buy on it’s own. It won’t work if thousands of people use it. I didn’t think you could bet with Pinnacle in the UK, it that correct or not? That’s correct, Pinnacle have no UK license. However it doesn’t matter as we aren’t betting with them. We use use their efficient odds to spot other bookmakers offering value ones.